A 44-year-old woman presented to our clinic with anemia and increased bruising. Her complete blood count revealed a white blood cell count of 15,400, a hemoglobin count of 10.7, and a platelet count of 390,000. Basophils accounted for 40% of the white blood cells. A bone marrow biopsy showed 9% blasts in 95% of the cellular bone marrow. Cytogenetic testing revealed a complex translocation between chromosomes 9, 22, and 5 in 20 of 20 metaphases. Results from a qualitative polymerase chain reaction test for BCR-ABL gene transcripts suggested a p210 transcript protein. A quantitative BCR-ABL analysis showed p210 messenger ribonucleic acid (mRNA) transcripts, estimated to represent 82.0% of total ABL gene transcripts. The patient started treatment with oral dasatinib (Sprycel) 100 mg once daily, which was titrated to 120 mg daily 2 weeks after treatment initiation and to 140 mg daily 3 weeks later. A second BCR-ABL analysis 3 months after the initial diagnosis showed p210 mRNA transcripts estimated to represent 22.0% of total ABL gene transcripts. The patient did not tolerate dasatinib, because of the drug’s gastrointestinal adverse events, such as abdominal cramping, pain, and bloody stools. She was therefore switched to oral nilotinib 300 mg twice daily approximately 5 months after diagnosis. The patient was not taking any medications that inhibit or induce the cytochrome P3A4, which interferes with nilotinib metabolism. Her liver function was normal, and she had no history of liver disease. Because of persistent abdominal cramping, pain, bloody stools, and light-headedness, and despite medical advice from her provider against it, the patient lowered her dose of nilotinib on her own to 150 mg daily. Six months after the initial diagnosis, nilotinib treatment was stopped for a short time because of worsening abdominal and bone pain. The patient was able to resume treatment once her pain improved, at a dose of nilotinib 150 mg 3 times weekly. The patient was offered to have her treatment switched to imatinib (Gleevec), but she refused. 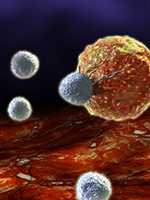 Twelve months after the diagnosis, a BCR-ABL analysis showed p210 mRNA transcripts estimated to represent 0.08% of total ABL gene transcripts, demonstrating a response to low-dose treatment with nilotinib. Thirteen months after diagnosis, the patient reported that she was still taking her 150-mg nilotinib capsule 3 times weekly but was unable to tolerate higher doses, because of worsening abdominal and bone discomfort with more frequent dosing. Eighteen months after diagnosis, she was able to increase her dose to 150 mg once daily 7 days weekly. At that time, a BCR-ABL analysis showed p210 mRNA transcripts estimated to represent 0.02% of total ABL gene transcripts. Because of concerns regarding long-term damage to her bone marrow, and against medical advice, the patient discontinued treatment with nilotinib 22 months after diagnosis. A bone marrow biopsy and an aspiration at month 22 when treatment was discontinued, revealed normal cytogenetics, negative fluorescence in situ hybridization for BCR-ABL gene transcripts, and no morphologic evidence of CML in her bone marrow. A BCR-ABL test performed 27 months after diagnosis detected p210 mRNA transcripts at a very low quantitative level (<0.01% of total ABL gene transcripts). Therefore, we believe that a significant number of patients with CML may actually be using lower doses of tyrosine kinase inhibitors than their physicians assume, because of side effects or the patients’ desire to maintain the relationship with their physician. To our knowledge, this is the first case of successful treatment of a patient with CML using low-dose nilotinib therapy. Therefore, this case constitutes an important observation that treatment, with nilotinib at much lower doses than currently recommended, may still lead to a major molecular response in patients with CML. This may warrant further study in patients who cannot tolerate treatment at standard doses, or those whose disease is stable and who have sustained major molecular response in CML. Mr Haigh and Dr Darabi have no conflicts of interest to report. 1. Tasigna (nilotinib) capsules [prescribing information]. East Hanover, NJ: Novartis Pharmaceuticals; February 2017. 2. Gurion R, Raanani P, Vidal L, et al. First line treatment with newer tyrosine kinase inhibitors in chronic myeloid leukemia associated with deep and durable molecular response - systematic review and meta-analysis. Acta Oncol. 2016;25:1-7. 3. Sidorkiewicz S, Tran VT, Cousyn C, et al. Discordance between drug adherence as reported by patients and drug importance as assessed by physicians. Ann Fam Med. 2016;14:415-421.